I’ve been sick. My Janathon workout for the past two days has been non-stop Shavasana practiced in two locations: my bed and the couch. I definitely need some serious therapy because I learned over the past two days that laying around, even when I’m ill, fills me with guilt. It must be the industrious American values in me that thinks if I’m not contributing in some way to the household or the gross national product that I am failing the world and therefore am undeserving of my place in the tribe. It sounds so awful to hear myself write that basically I judge myself extremely harshly for having the nerve to actually be sick for two days. You should have seen the guilt and torment I put myself through when I made myself function at full capacity with a severely sprained ankle. Therapy. So much therapy is needed here. On the positive side, over the last couple of days I was too sick and tired to spend much time feeling guilty or judgemental of myself. I dove into much reading. My books “True Hauntings” and “AMC Guide To Outdoor Leadership” both got some serious love. I watching the movie White Christmas, which believe it or not I’ve never seen before. 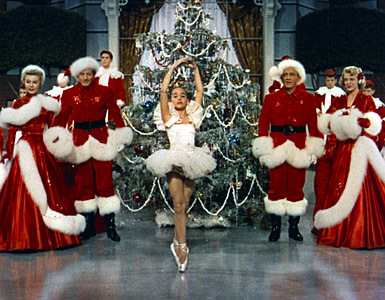 Holy schnikies, did anyone in the world ever have longer legs than Vera Ellen?! And I watched quite a bit of Adam Sevani dancing on Youtube. I even watched the movie “LOL” with Miley Cyrus and Demi Moore. I wanted to scoff at it and totally hate it, but found myself completely engrossed. Probably because I’m a girl and it is pretty relatable to anyone who was ever a teenage girl. And also because I am a huge fan of Adam Sevani who plays an adorable character in this movie. In fact, I’m sure that the reason I like this movie so much is because Adam Sevani was in it. I’m in total awe of his dancing and think his acting is so cute. I was a dancer throughout my childhood and I still really enjoy it, but it is more of a periodic armchair obsession lately as I haven’t found a great place locally to shake my groove thang. Plus, I’m totally intimidated by how good even child dancers have become. When you look at the child dancers in White Christmas, they are total oafs hobbling awkwardly around on red and white toe shoes. There would never be such clumsy dancing children in movies today. Today they’d be quintuple pirouetting around that Christmas tree and one of them would back flip over it, land on top of the star, balancing on one hand, doing the full splits. If you’ve never seen LXD (League of Xtraordinary Dancers) you simply must. Incidentally I also saw the guy who stars in this episode on a brochure in the Sprint Store. That face! Bellisimo! Today, I am feeling much better. After a strong cup of coffee I put on my walking shoes and went for a 3 mile walk/hike in the Upper Las Virgenes Canyon Open Space Preserve. We are reaching the end of the dry season and all of the trails are just about as parched as they can possibly be. I find myself looking forward to the rainy season so I can see how the shrubbery on the landscape changes, and I would like to see some of the local waterfalls in action. The good news is that I’m back on the trail. Apart from a headache and a slightly lower energy level I’m back in action. Hi Ho Silver! Away! Lovely portion of the trail through El Scorpion Canyon Park. Every time I walk under this tree I think “I love hiking”.